1. Hold belt at its center, ends even, with stripes (if you have them) on the left. 2. Place center of belt on front center of jacket, about one inch below the naval (a location called the tanden). 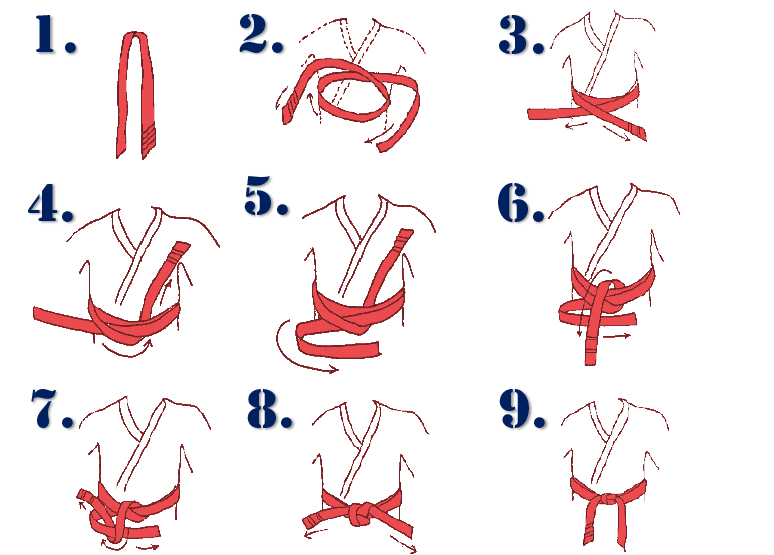 Wrap belt around your waist, crossing the right side over the left side at center of the back. Stripes will now be on your right side. Pull ends of belt forward and adjust so the ends are even. 3. Lay the left side of belt over the tanden. Lay the right side of belt across the tanden. Stripes will now be on your left side. 4. Slide the left side of belt (striped side) under and behind all the belt layers at the tanden. Stripes will still be on your left side. 6. Bring left (striped) end of belt down and over the front of the U. 7. Loop striped end under and up through the U shape to form a knot. 8. Pull ends of belt outward to tighten knot. Stripes will be on your right side. 9. Adjust knot so the ends of belt are even and hang neatly.